On the behalf of Ladies-of-the-Heart and the Awards Director I am proud to present you with this award for the month of January ~ 2001! July 2000 ~ My Holiday Hotel site has been chosen for the Holidays for Fun Webring's July/August 2000 Award. Thank you so much Marian and The Holidays for Fun Webring for selecting my site for your prestigious award for which I am not only honored but delighted to receive!! I would like to take this opportunity to sincerely Thank You Marian aka. Estee Pinky for all your hard work and dedication in running your webrings and for taking the time to do the special things and contests that you do for your members. You have a wonderful gift of making your members feel special which makes all the difference in the world!! A little recognition for our efforts sure goes a long, long way. Especially when you think of just how many holiday web pages that are included in your webrings. So if you're not part of The Holidays for Fun Webrings and you have Holiday pages, stop by today and sign up. Donna is a very creative woman. Her designs of her many holiday sites based on "hotels" are very unique, adorable, and even inspirational that I don't see many "hotel" sites out there like hers. She was awarded for the first place of a couple of my holiday webrings, Happy Father's Day and Happy 4th of July webrings. A number of those ring members voted Donna's Father's Day and July 4th sites as the best ones because of excellent contents in originality, beauty, graphics, and texts. Not just her couple of sites, I have visited her other holiday sites that are very fascinating and lovely! 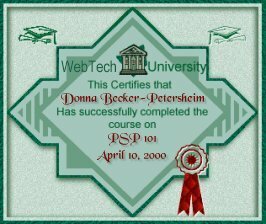 April 2000 ~ I've completed the special Paint Shop Pro 101 and 201 course offered by GeoCities. I'd like to thank GeoCities for making it possible for me to learn on-line. I have to say this is my kind of learning! Most of all I'd like to thank my instructor Diane who went above and beyond to help me with my lessons and who made learning so much fun. It's so nice to know there are actual people on line willing to volunteer their time to help ordinary people like me. Thanks Diane you were terrific!! If you too would like to learn to make your own graphics stop by and sign up for a class today! I guarantee you'll be glad you did!! Thank You Diane for these Special Awards! !